Kiox offers all the functions that a sporty rider could need. 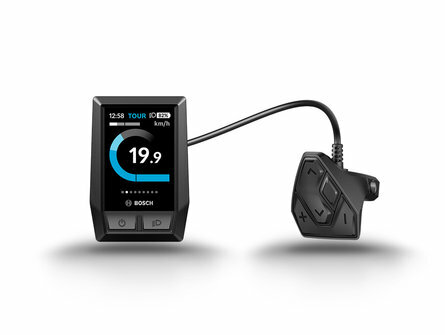 The small, scratch-resistant colour display is controlled by the separate control unit with clear tactile feedback and delivers riding data on speed, rider performance, heart rate, battery charge and much more. 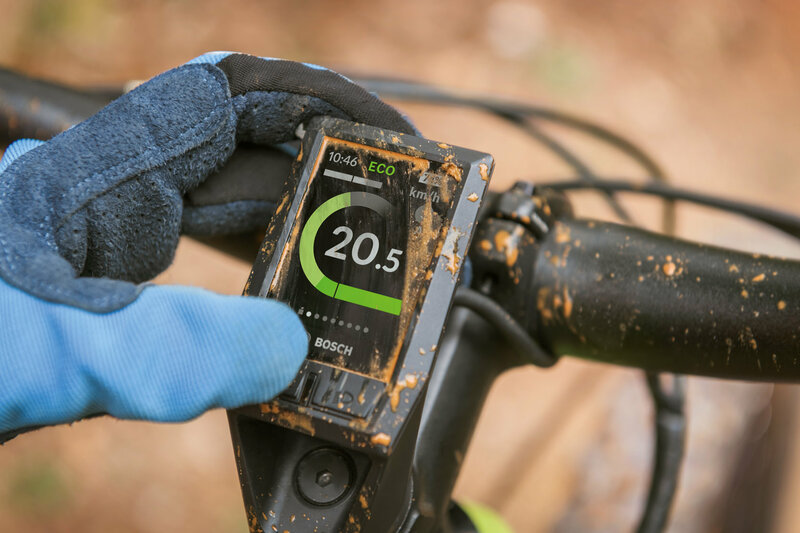 Kiox means you have all essential information at your finger tips, while keeping control of the handlebar and terrain thanks to the separate Remote Compact. Using Bluetooth technology with an optional chest strap, Kiox users can check their current pulse range at all times, enabling them to get the most out of their training. The Bluetooth low energy interface also enables updates to the software to be downloaded onto your on-board computer without requiring a cable connection. More connectivity functions are to follow. Climb on, switch on, ride away and have fun. The on-board computer can be used immediately and provides you with all the essential information and data. The Kiox on-board computer excels not only because of its functional features – visually, it's a real head-turner as well: small and handy, the Kiox comes in a clear, neatly arranged yet stylish design. The practical magnetic holder integrally mounted on either the steam or in the handle bars likewise lends a neat and tidy look. The 1.9" transmissive colour display guarantees perfect readability even under strong sunlight. And because the backlight adapts to the lighting conditions, everything is perfectly readable - even in the dark. Use Bluetooth Low Energy (BLE) to connect the Kiox to a heart rate monitor such as a Polar H7. This allows you to monitor your heart rate and get the most out of your training. 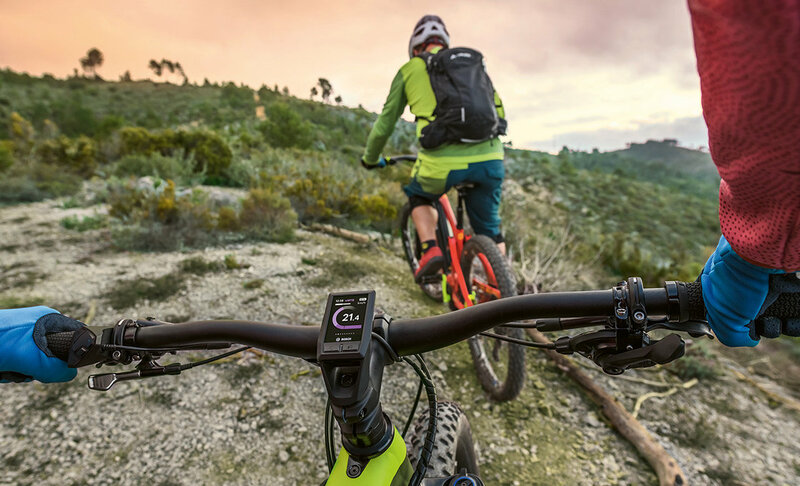 Improve your level of fitness: for example, an indicator on the display shows you whether you are riding at above or below your average speed. This will motivate you to push yourself even harder. The buttons enable the on-board computer to be operated safely and comfortably using your thumb. The distinct, tactile pressure behind the buttons during operation gives the rider clear feedback. Whether dirt or stone chippings: the scratch-resistant gorilla glass display is an ideal partner both off road and in the city. The magnetic holder allows easy removal of the on-board computer for stowing it away quickly, as well as fast, secure attachment – holding firm even during off-road jumping. Light: Conveniently turn on your connected bike light from the mechanical button on the Kiox. Settings: Settings can changed quickly and easily from the status overview display. For safety reasons, you can only do so when the eBike is at a standstill. Device recharging: External devices such as your smartphone can be recharged via the USB port. Overview: A summary of your day's activities is provided to you in the off-board mode. 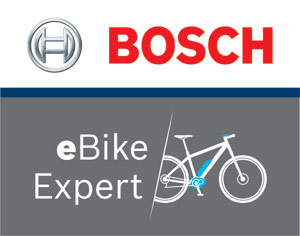 Service: A display lets you know when your next maintenance appointment is due – thereby ensuring the value and service life of your eBike's components. Your dealer can simply connect the DiagnosticTool via the USB port to download the latest software updates. Walk assistance: This 2-level function helps you push your eBike at speeds of up to 6 km/h – whether you're carrying luggage aboard or not, or if you're overcoming obstacles. 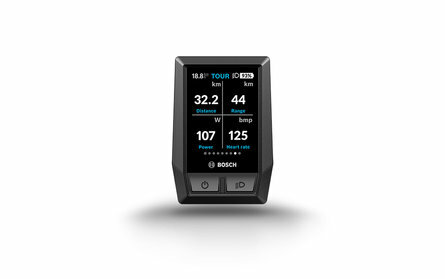 Distance measurement / wheel size: You can finely adjust your wheel size setting yourself at the push of a button. This allows high-precision distance measurement even after changing a tyre. 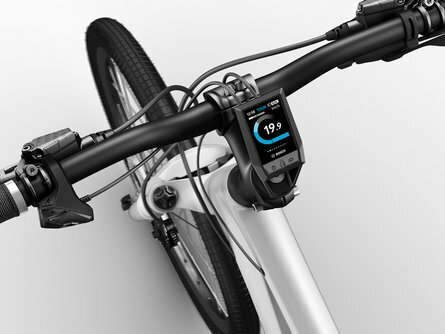 DualBattery support: The charge level of both batteries is displayed in the status overview, providing valuable information on battery discharge behaviour while riding. A talented linguist: Whether German, English, Dutch, French, Italian, Spanish, Danish, Swedish or Portuguese, simply set the language of your choice.